Stoney Girl Gardens is leading the industry with research and development of strains, proper cannabis oil dosages, treatments and applications. If you are a new user please consult the information below for the most effective method of treatment. Oral Treatment is divided into two areas; Maintenance and Full Immersion. A maintenance dose is usually no more than 1/20th of a gram (100mg) of cannabis oil daily. This is considered a low dose and has little to no psychoactive affects. A 1/20th dose will effectively control seizures, chromes, MS, Lupus, Alzheimer’s, Parkinson’s, Autism, Chronic Pain, Migraines, Nausea, Cramps and many more conditions. Low doses have also been effective in curing Breast Cancer. We have been able to control seizures in small children with just 1/60th of a gram, however we recommend 1/20th of a gram dose for most children. This low dose has little to no psychoactive affects. A Full Immersion treatment is recommended for those with stage 4 or aggressive cancers and tumors. A full immersion treatment requires higher doses, up to 1 gram daily for a period of 60 to 90 days. The oil begins working immediately. You will see the affects in days and weeks, not weeks and months. We have seen the effects on the destruction of tumors begin in literally hours. It is important to remember that you should apply the oil treatment as close to the tumor or condition to be treated as possible. If the tumor is a surface tumor, then you should apply the oil directly to the skin. If you are dealing with carcinoma or melanoma then you should apply it directly to the area affected. Carcinoma, Melanoma, Spider Bite, Surface pain, Surface Tumor: Apply oil directly to affected area. Topical: For topical applications the oil can be used as is or it can be mixed into lotions and oils. Mix 1 gram for every 16 ounces of lotion or oil. Cooking: When coking add a measured amount into your existing recipe. It is easily measured for predictable and consistent dosing. 10 doses per gram. 1 gram for 10 expected portions. 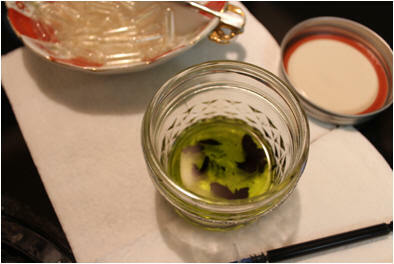 Elixirs: The oil can be re-hydrated into any alcohol solution to be used as a tincture. Glycerin and fine oils such as grape seed oil can be used to dilute the Whole Plant Extract Oil for oral administration. Flavors may be added. Follow the Ratio Chart below. It is always best to start with a low dose and work up to a higher dose. To make a 20:1 you will add 20 parts coconut oil to one part cannabis oil. 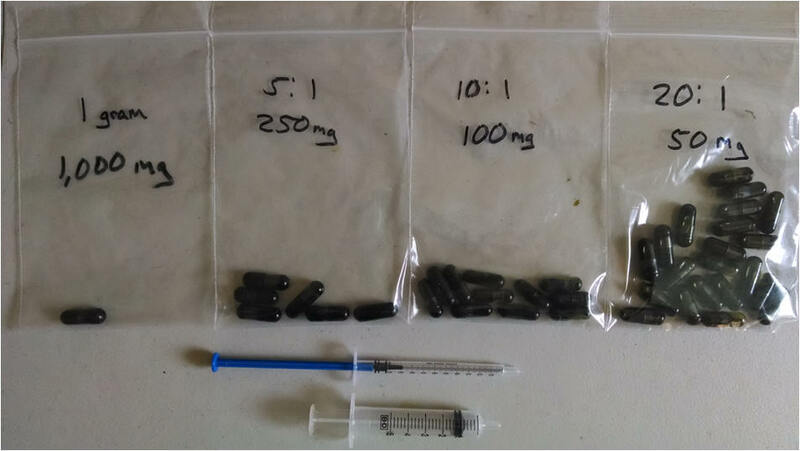 Note the Units/Gram shows the number of doses per gram of cannabis extract. A 20:1 ratio will make 21 doses. This oil is highly concentrated and may require dilution to allow you to build up tolerance and become accustomed to the effects. If you have never used cannabis products you should follow the following recommendations. Severe overdose may occur if too much oil is consumed. Overdose is not harmful however very uncomfortable with a feeling of sea sickness which will dissipate within a few hours. To avoid this follow the dilution recommendations below. It is recommended that a low dose of 1/20 of a gram be administered as a start. If your wanting to work up to 1 gram per day you will need to build a resistance first. Every individual is different and has a differing level of tolerance. Tolerance level is the amount of oil you can tolerate comfortably. Your tolerance level will build as you use the oil. In other words, you will be able to take more oil without feeling the effects after a few days or weeks. To find your tolerance level take one capsule of a 20:1 dose and wait 2 hours. If you don’t feel anything then go ahead and take another capsule, then wait another 2 hours. Repeat this process until you start feeling affects then STOP. Count the number of capsules you took that day. This will help you in finding the correct maximum dosage you should start with. If you take more than 2 in a day then you can increase your dosage mix instructions to the 10:1 or 1/10 gram capsules. Some people can only take one capsule in a day, others can take as many as 12. 1 ML = 1 CC = 1 Gram NO CONVERSION! Use 1/20th gram of Cannabis Oil To Start – since measuring a small amount of cannabis oil is difficult we recommend mixing Coconut Oil with the cannabis oil at a rate of 20 to 1. This will allow you to measure one gram of coconut oil/cannabis oil mix into a gel capsule for easy administration. A double ‘00’ capsule holds approximately one gram of mix. Start by getting some Organic Coconut Oil that is refined and expeller pressed. You will find this in the Health Food section of your local market. Coconut oil will assist the cannabis oil in metabolizing in your body and assists in a faster onset of relief. Using an Oral Syringe, measure 20 ml or grams of Coconut Oil into a container. A 10 ml syringe works great, filling the syringe 2 times with coconut oil. 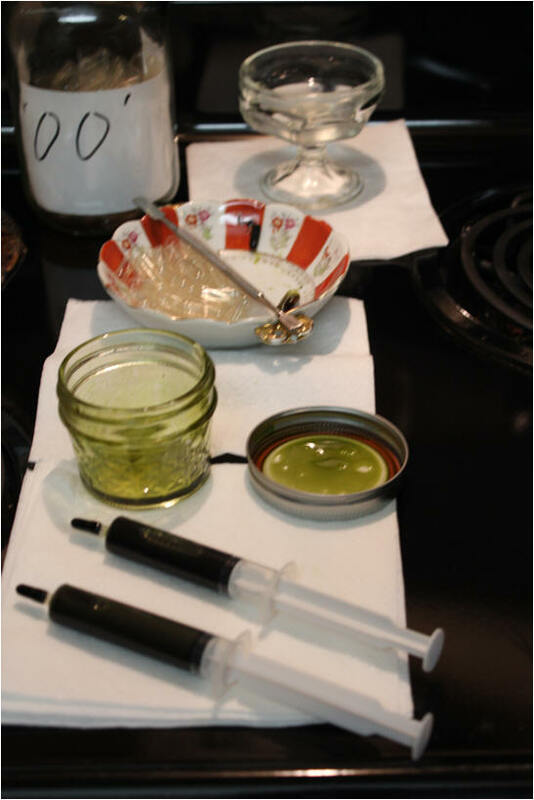 Add ONE gram or ml of Cannabis Extract Oil. 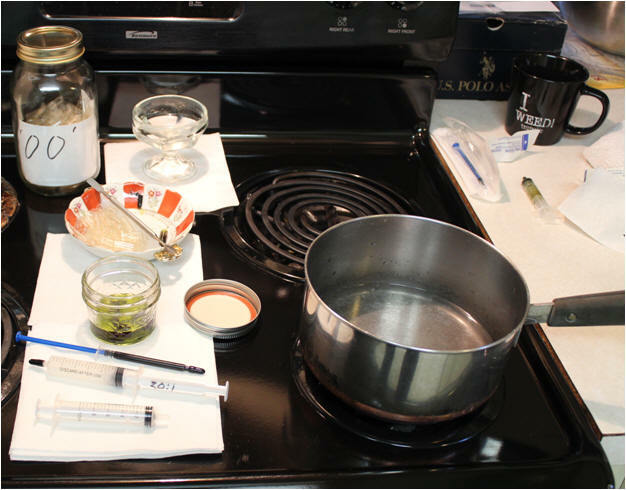 Shown here is the work area with 2-10cc syringes (one filled with coconut oil), 1-1cc syringe of cannabis oil, a mixing jar with oils already measured, a bowl of ’00’ 1 gram capsules, and a bowl of coconut oil that has been warmed (in background). 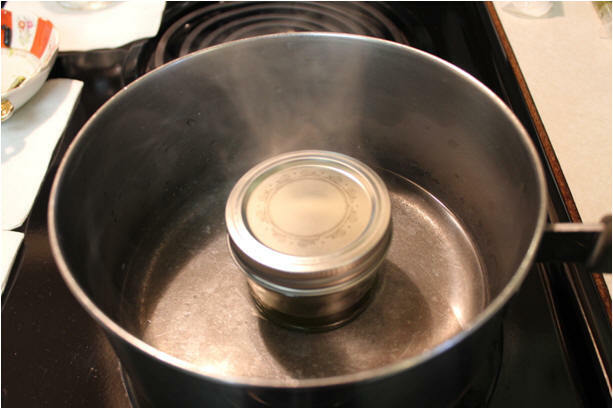 Keep Cannabis and Coconut Oils cold in mixing jars before heating. There are 20 grams of coconut oil and one gram of cannabis oil. Lightly warm the mixture by placing the container of mix in a pan of hot water. Stir mixture while warm. We use a small 4 o jar with a lid. This keeps the water out of the mixture and allows us to shake the jar to mix the contents well. The cannabis oil will bond to the coconut oil. Below is a photo of the properly heated mixture. Fill a clean oral syringe with this mixture while it is still warm. You now have a mixture that is 1:20 ratio. Fill the one gram “00” capsules while still warm. Caps will store for months. Photo below shows caps being filled. 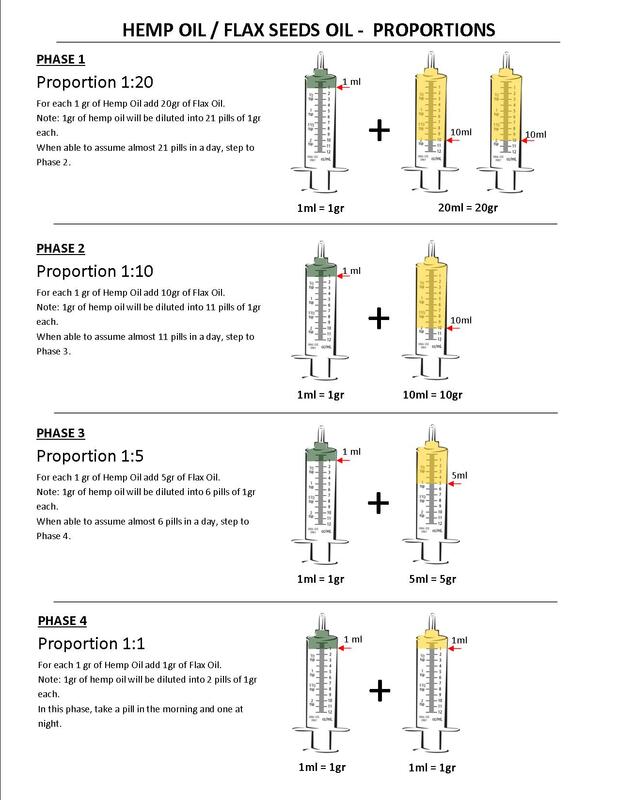 Increase dosages as possible and as needed by making a mixture of 1:10 and then following dosages after that of 1:5 and then later working up to taking the oil straight without being mixed. Increase dosage as possible up to one gram of pure oil per day. We recommend one half gram in the morning and one half gram 2 hours before bed time. It may take several weeks to up your dosage and it’s ok to push but maintain a comfort level. Oil may be taken in the evening for those that work during the day. Taking a dose at 7pm will allow the oil to become affective and work during the hours of sleep, allowing you to wake up and go to work and operate machinery. Dosage Level One (1:20): Take one capsule and wait 90 minutes. If you don’t feel effects take another capsule and wait another 90 minutes. Continue taking capsules to find the level you can tolerate and still feel comfortable. 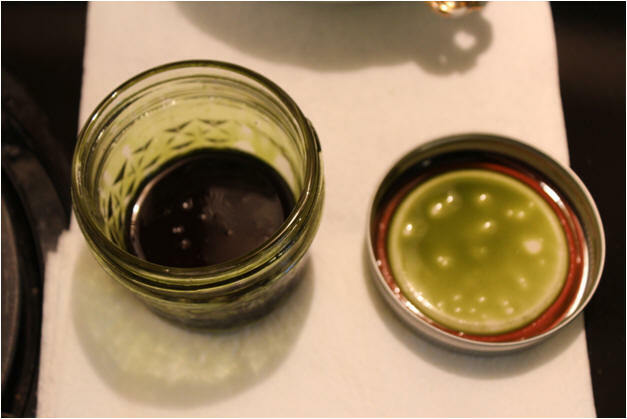 Dosage Level Two (1:10): Mix 10 grams of Coconut Oil to One Gram of Cannabis Extract Oil. Take one capsule daily and work up to 2 capsules daily. 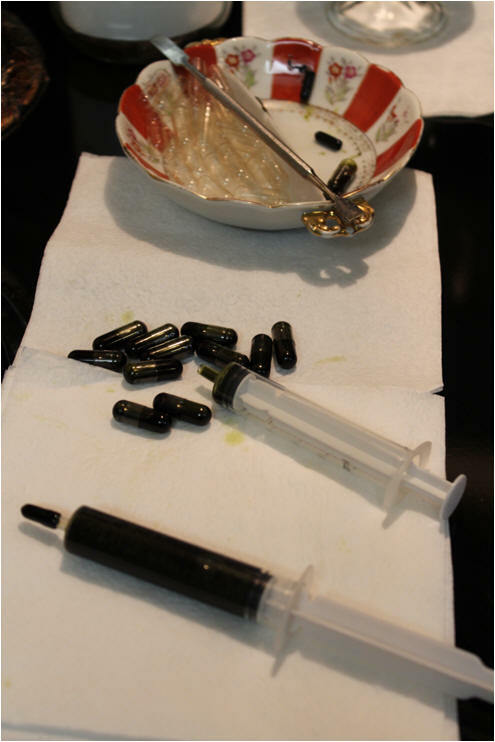 Dosage Level Three (1:5): Mix 5 grams of Coconut Oil to One Gram of Cannabis Extract Oil. Take one capsule daily and work up to 2 capsules daily. Dosage level Four (1:1): Mix 1 gram of Coconut Oil to One Gram of Cannabis Extract Oil. Take one capsule daily and work up to 2 capsules daily. We recommend one half dose in the morning and one half dose 2 hours before bed time. 90 gram jars = 1890 caps or close to 6 years of medicine in maintenance mode or 90 days of cancer immersion treatment at one gram per day.